It is the week of Christmas! I love this time of year, the food, fun and family. This weeks Dinner Menu was easy to put together since I planned a few weeks ago what we would be having over Christmas. Wednesday - Christmas Dinner at our Home, Turkey, Stuffing, Gravy, Mashed Potatoes, Carrots, Green Beans, Sweet Potatoes, Turnip, Cranberry Sauce and lots of cookies and bars for Dessert. Sunday - Turkey Soup, Grilled Cheese Sandwiches. Merry Christmas and Happy Holidays to Everyone ! This weeks Menu will include a lot of simple dinners. It is the week before Christmas and we have a lot of things on the go. Some of the meals this week I will be using items that I made ahead of time and froze. Monday's, Wednesdays, and Thursdays meals, aside from the salad, and cooking the noodles for the Spaghetti are ready. Just need to warm them up. Find more menus to inspire you at Organized Junkie. 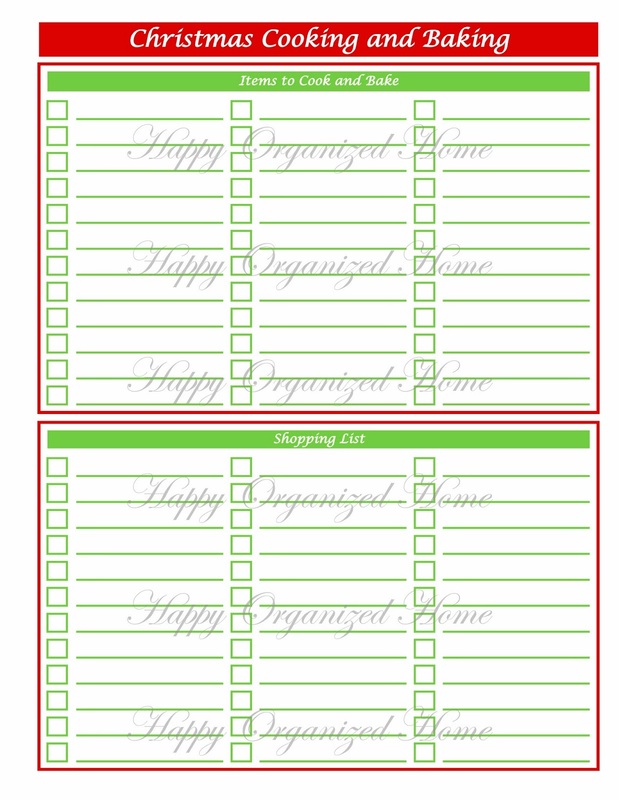 Need a menu plan printable? Visit our Printable Items on Etsy page for that and more. It is that time of year where Christmas Baking is on a lot of peoples minds. Every Year I bake a lot of Christmas goodies that I make ahead and freeze. Having my Christmas Baking done earlier in December makes celebrating the holidays easier and more enjoyable. In Early December I start planning what I will be baking and cooking for the holidays. 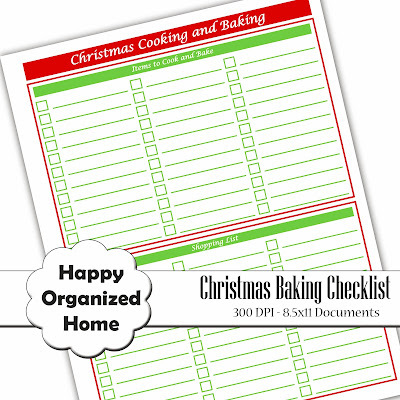 I use this Christmas Baking and Cooking Checklist to write down all of the items that I will be making. At the bottom of the list I have a shopping list that I can add the items that I need to purchase. Once I have completed cooking the item on my list, I just check it off. Something that always used to be a problem for me was trying to remember where I have the recipe for that special cookie that I only make for the holidays. 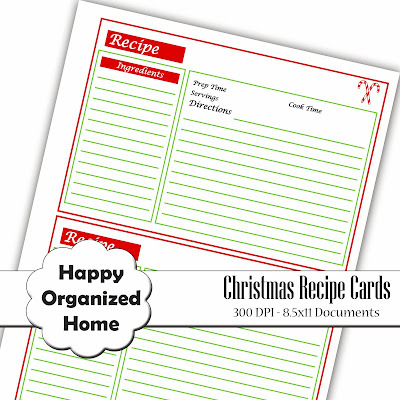 To keep everything organized, I decided to create recipe cards that I keep in my Holiday Binder. I like Hand writing my recipes, because I think it adds a personal touch. When these recipes are handed down to the next generation, they will have my recipes in my hand writing. Priceless. In my Etsy shop, I have a set available where you can purchase the recipe cards and the checklists. 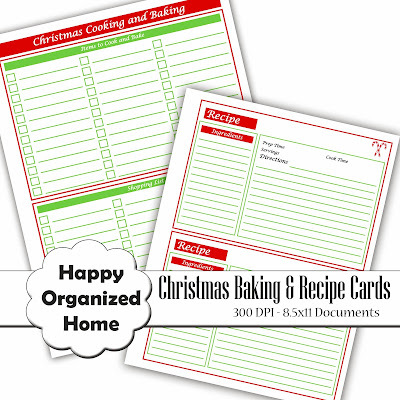 Currently these are 25% off, to help get you started on organizing your cooking and baking. It is that time of year again, the holiday season! 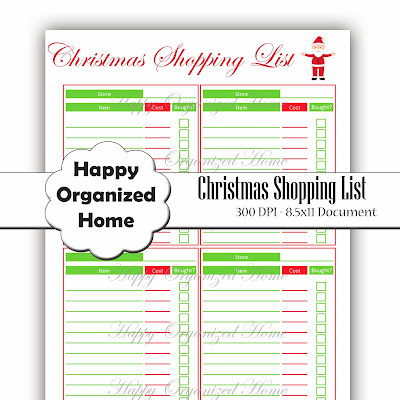 When it comes to the Holidays and Christmas it is a must to be organized so that you can stay Happy and Stress Free. One of the many tasks that happens during the holiday season is Shopping for Gifts. 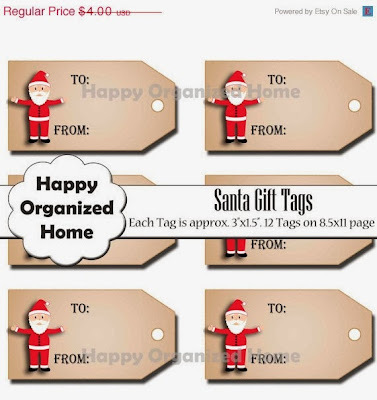 Whether it is gifts for your Family, Friends or even your children's teacher, having a list of everyone that you are buying for, what you are purchasing, and whether you have already purchased and wrapped it will take a lot of stress off of you. When you have your list ready, the next step is shopping! I love shopping, especially when it comes to Christmas Presents. Just like when I go grocery shopping I have a prepared list, when it comes to Christmas Gift shopping I also ensure that I have a shopping list ready and with me. Organizing your shopping list by store makes it even easier. Once you have finally found a parking spot at the mall (sorry can't help with that stress), you can enter the mall organized and ready to shop. You know which stores you have to hit, and what you need to pick up at that store. I love using this list when it comes to Christmas Shopping. When you get home, you just refer to your original Gift Planner, and mark what you have wrapped. No more running around on Christmas Eve shopping, and trying to get everything wrapped. You can find these gift giving planners in my Etsy Shop. Black Friday/Cyber Mondday Sale on Etsy - 50% off everything! It's that time of year. The Holiday Season is upon us. During the Holidays, life can become overwhelming. With all of the parties, gifts to buy and cookies that will need to be baked. 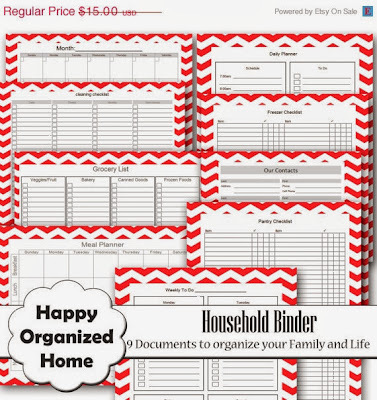 Now is the perfect time to get your family organized. For Black Friday and Cyber Monday, my entire shop on Etsy is on sale for 50% off. 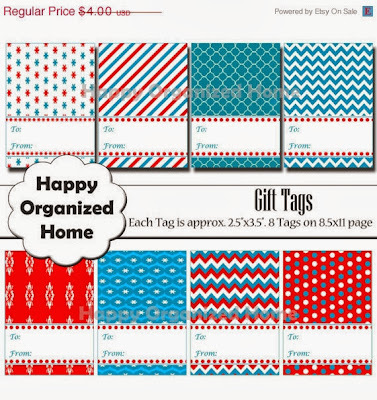 Stock up now for all Organizing and Gift giving needs. It Back to School time! Some regions school has already started, but for us School starts again after Labour Day. The week before school starts for us is all about getting everything organized for back to school. There is nothing worse then waking up on the first day of school and running around trying to get everything ready before it's time to leave. Some of the things that we have started doing is organizing what we need for School Lunches. The school that my son goes to prefers if parents send lunches that do not produce any litter. His school is also nut free which has posed some issues when it came to deciding how and what we would use to make his lunch. One of the things that we have done is purchase plastic (BPA Free) containers that he can easily open without the threat of the food spilling everywhere. We had originally looked at containers that were like bento boxes, but decided against them because they did not fit is his lunch bag as we would need to include 2 for his lunch. The school runs on a balanced day, which essentially means that they have 2 lunch/snack breaks with recess. This means that his lunch had to be separated into 2 containers. One for Snack 1 and another for Snack 2. 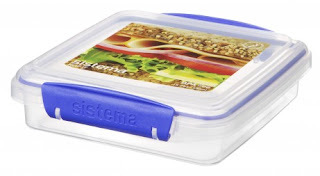 We decided to purchase these containers called Sistema. We found them at Homesense, and also have seen them at Bed Bath and Beyond. They are great because he can easily open them, 2 fit in his lunch bag with drinks and they are dishwasher safe! Win, Win, Win. I still wanted to be able to separate the food in his lunch containers, so I purchased some silicone muffin cups that can be used in his lunch to keep everything separate. We also purchased Labels to add to the items from Mabel's Labels. You can purchase labels that are dishwasher safe! They are great. Just add them to your containers and they do not fade, they never fall off and you can choose patterns that fit to whatever your child loves. Our Son really loves Firetrucks so we chose that for our labels. We labeled the lunches Snack 1 and Snack 2 so that he can easily see what it is in his lunches. I love how sturdy these containers are and how much room they have, so that as he grows and needs a larger lunch, these containers can grow with him. For Drinks we went with reusable plastic drink boxes. Labeled them as we did the containers. 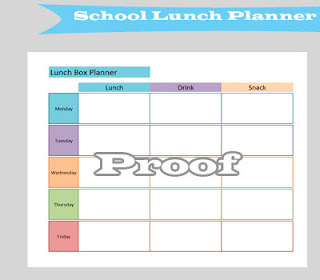 One of the last things that we have started using since he started school is a School Lunch Meal Planner. When I am making my meal plan for the week, I also plan out his meals for school lunches. This is so much easier then starting to make his lunch and not know what to include. When making your grocery list this helps to ensure that you purchase everything that you need for school lunches and do not run into the situation where you are out of what you need for the school lunch. I still have more organizing to do, including his closet. More on that another day. Back to School time! It is amazing that it is almost time for the kids to hit the books and parents to wonder how am I going to keep everything organized. When it's time for Back to School it can bring a wave of emotions not just for the kids who are anxious to know who will be in their class and who will be their teacher but also for parents. This is the time when parents need to ensure that they have everything ready for that first day and also how are they going to ensure all of the homework is done, dates for activities are remembered and don't forget school lunches! This doesn't have to seem like a daunting task if you keep yourself organized right from the start. Some of the things that you can do to keep yourself organized is to include a section in your family binder with all of the school related tasks and activities. 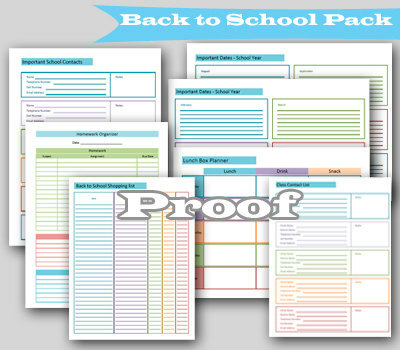 I have added a Back To School organizing pack to my Etsy Shop which includes a bunch of organizing documents to start of the school year stress free. Full Year Calendar - this includes all 12 months of the year. The dates are left blank allowing you to use the same printable year after year. All you have to do is add the dates and you are ready to go. 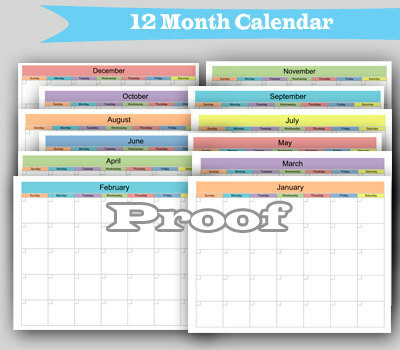 Important Dates Calendar - this is a 2 page document that include 6 months per page. On here you can quickly write down the important dates that are coming up each month. It includes the month as a header and the a few lines to add the important info that is happening that month. principals and any other assistants that you will need to contact throughout the year. Homework Organizer - The dreaded homework! It can be difficult to ensure that your child or children have completed all of their homework. This organizer will help organizing the subject, assignment and due date for your child's homework. Back to school Shopping - This template allows you to write down everything you need to buy, and which store, how many you need and the price. Once you have purchased the items you just check it off. Well the heat wave is over and instead of returning to normal temperatures, the weather is unseasonably cool. We are having some cozy meals as well as some grilling this week. Lunch for the week - Leftovers, Sandwiches, Fruit, Veggies, Cheese and Crackers. Monday - Roasted Butternut Squash Soup, Cheese bread. 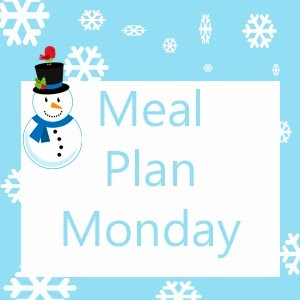 Whats on your meal plan for this week? 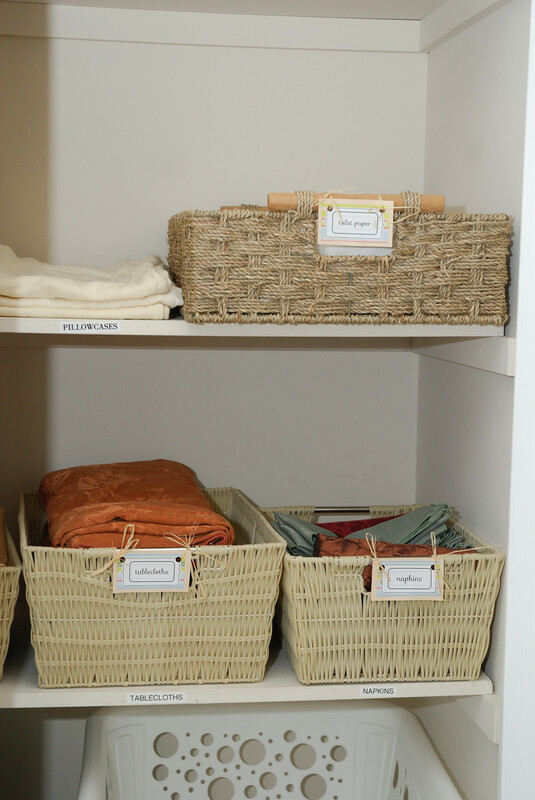 A few weeks ago I organized my linen closet. I was really pleased on how it had turned out but decided that I could make a small change to the way I had labeled some of the items. Previously I had not labeled the baskets, but have just labeled the shelves under each basket. I felt like I could do better than that. 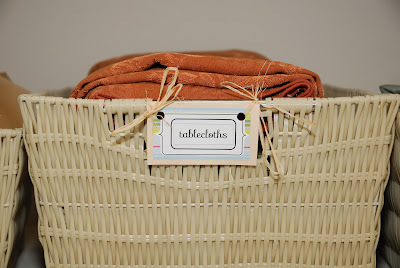 I created new labels and attached them to the basket with rafia. What I did was create a template for the labels in excel which I can use over and over again. I printed them off in black and white and cut them out. After that I affixed them to some Amy Butler (i heart Amy Butler) paper. I am not sure what the name of the Amy Butler design is, but it is a stripe pattern. Once that was complete I affixed them to some creamy coloured cardstock and hole punch them to attach them to the baskets. Here is the finished product. I am very happy with how the labels turned out. 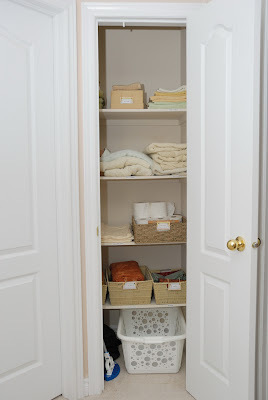 It adds just a little something something to the linen closet that was lacking before. The best thing about this is that after creating the label template, the entire project took about 20 minutes to complete. es I am going to talk about toilet brushes. It is a topic that needs to be discussed. Well maybe it does not need to be discussed, but I do have a tip that I wanted to share. I do not know anyone that enjoys cleaning a toilet. If you are one of those people that actually enjoys it, well I am not sure what I can say to that. While I understand the cleaning effectiveness of a toilet brush, the thought of dragging one from bathroom to bathroom just grosses me out. This brings me to my cleaning tip. Buy a toilet brush for each bathroom in your home. 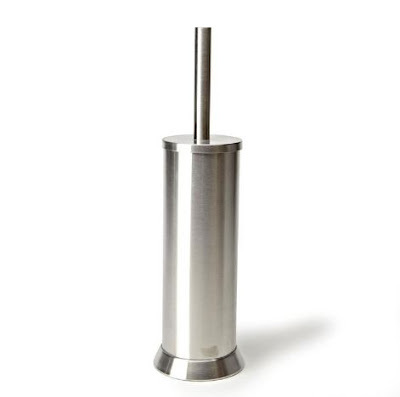 I know that I am not the only person to do this, but to me a bathroom is not complete unless it has one of these babies on hand. They are inexpensive to purchase, and if you are lucky you can even get them on sale ! I purchased mine from Kitchen Stuff Plus and they are stainless steel. They were on sale for $14.99 which is not too bad. Now when I have to complete the daunting task of cleaning a toilet, the toilet brush is right there. It does not make the task any better, but it does lesson the blow. If you have not noticed I love scrapbook paper. You can find such beautiful papers and they only cost about $1 a sheet or less. What I also love is storage boxes, but I do not love how much they cost. It is hard to find a really pretty storage box for under $5. While working on another project I was sidetracked by the white photo storage boxes that I had on my book shelf. They needed something extra. At first I thought about painting them, but than had a brilliant idea! Why not cover the top of the box with scrapbook paper. I pulled out my scrapbook paper and found some papers that coordinated with the decor, pulled out my scissors and trusty glue stick. At first I thought I could just wrap the top of the box like a present, but that was not going to work, since the boxes are 11.5 inches on the top and the paper is 12x12. Ok Idea #2. What you will need is a photo box, and about 1 1/2 sheets of 12x12 scrapbook paper. I used a lighter weight paper, as I think card stock would add to much bulk to the lid and make it hard to close.Also you will need a glue stick and scissors. By the way, I purchased these photo boxes at Michael's for $2.50. I decided that I would cut out a piece of paper that covered just the top of the box and then wrap the sides separately. First place the lid on the backside of your 12x12 scrap book paper and mark where you are going to cut. You only need about 1/4 inch of overhang on each side of the box lid to cover the top and you are going to use what is remaining from this sheet to cover part of the sides. Cut out the paper and apply glue to the back of the paper. Be liberal when applying the glue and be sure to get the edges. Apply the paper to the top of the box smoothing out the paper, being sure to have about 1/4 inch of overhang on all side. Cut a slit into all 4 corners, directly from the corner of the paper to the corner of the box. Be careful not to cut to far, just to the corner of the box. Take the long side of the paper that is overhanging the box and apply it to the box, wrapping the little triangle piece that you have left over to wrap around. I hope you can understand from the picture above. Than do the same to the short side of the box until it is all wrapping the sides like in the picture above. This is what you will have now. The top is covered and you need to tackle the sides with the paper that you have remaining. Take the piece of paper that you had remaining from when you cut the piece for the top, and cut it in half lengthwise. If you had not used to much paper for the top, you should have enough to cover the 2 long side of the box. Apply glue liberally to the back of the strip of paper and affix to the box, just a little bit down from the edge. Wrap the paper around the sides of the box and then fold like you were wrapping a present. Then fold over the remaining edge and affix to the inside of the box. If you work quickly the glue will still stick, but if the glue is starting to dry, and a bit more glue to the flap before you fold it down. Do the same to the other side of the box so that both long sides of the box and paper affixed to the sides. Next measure and cut a piece of paper for the short sides of the box, just like you did for the long sides, leaving a little bit extra to wrap around the edge to the inside. This piece should go from edge to edge of the short side of the box, without having an extra to wrap around the sides. You just want extra to wrap to the inside of the box. Glue to the paper to the side of the box, and wrap the overhang to the inside. Do the same to the other side. And that's it. You are done. It's not that hard to do, and really only takes about 10 to 15 minutes per box. You can see that with using a patterned paper, you can not even really see that the edges are put on separately. It just blends together. If you use a paper like a stripe, you will notice that the sides are from a separate piece but again that will just give it a different look. Here is what the top of the box looks like when it is done. Now all you have to do is create a label and your box is ready to be displayed. I love how these turned out. The ones in this picture are from a different paper, but the same colours. They coordinate very nicely together. The paper adds colour and texture to these plain white boxes for very little time and money. What could be better. While I like having a clean home, actually doing the cleaning is not on my list of most enjoyable tasks. For myself what I noticed is that if the cleaning supplies are easily accessible on each floor of my home, it makes the mundane task of cleaning much easier. What I have done is created a cleaning center on each floor of my home. This cleaning center includes all the cleaning supplies that I need to keep a clean home. To create a cleaning center is really quite simple. 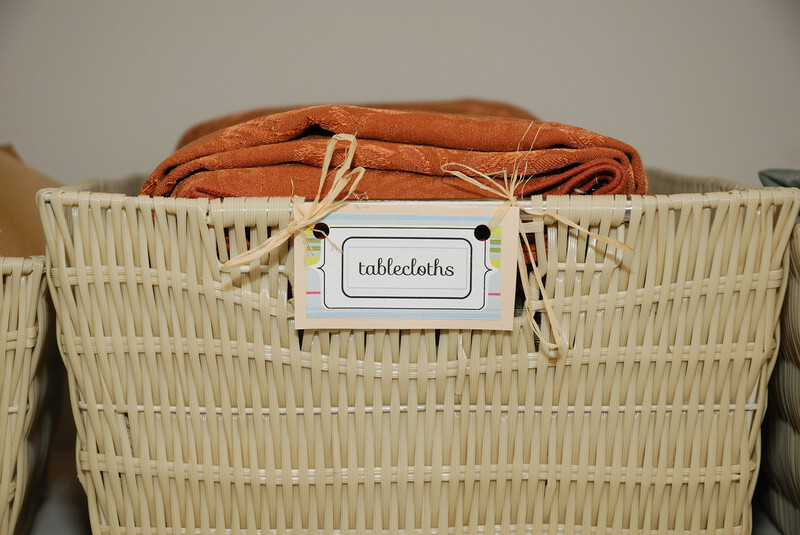 Just grab a basket and include everything that you need to keep your home clean in that basket. Bathroom Cleaners, such as toilet boil cleaner etc. Vacuum Cleaner. Yes I have a Vacuum cleaner on each floor of my home. Saves lugging it around. When you need to do a little cleaning, everything is right there. You can not use the excuse that you do not have what you need on hand to clean up because everything is right where you need it. What is your cleaning tip? We are in the midst of a major heat wave here so our meal plan for this week was designed to try and not use the oven, and make everything either on the barbeque, Microwave or in the Toaster Oven. Hopefully the weather will cool down a bit next week. Thursday - Hot Dogs, Hamburgers, Salad. 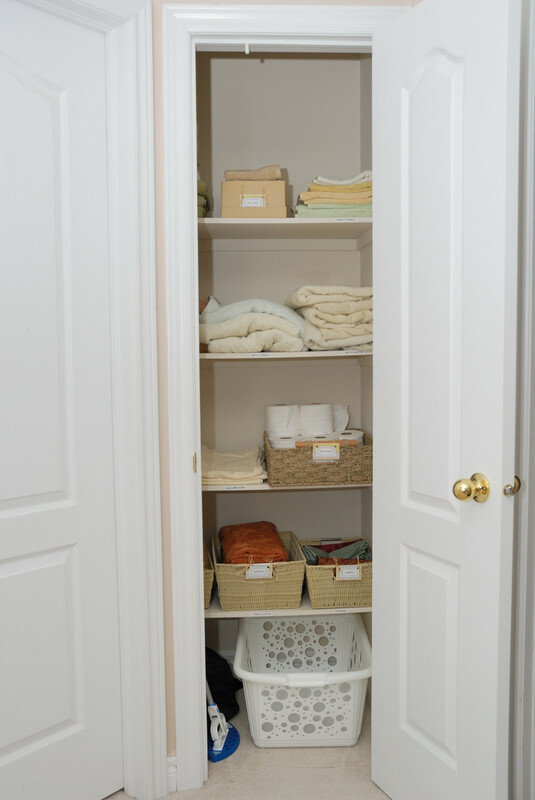 I thought I would share with you some of my bathroom organizing tips. First I am going to start with my son's bathroom. His bathroom is still a work in progress, but I am pleased with the progress we have made organizing the vanity. For my son's bathroom, we have painted the walls, removing the pink that was once there (yes everything in this house was pink when we purchased it). We still need to change out the mirror and the counter tops. On the counter you will see a picture frame. That is for our bedtime routine. I purchased an acrylic frame that has a stand on clearance at bed bath and beyond. The bedtime routine idea come from iheart organizing. I created our own bedtime routine in word, printed it off, cut it out and glued it to cardstock. Next in the vanity I have organized a few things. Since this bathroom is only used by my son and guests, I used the vanity to keep all of his bath towels and bubble bath organized. I also added my bathroom cleaning basket in his vanity. Next I have all of my son's bubble baths, lotions and creams in this basket. In the middle cupboard I have his bath towels, wash clothes, and behind the wash clothes I have a vaporizer for when we are sick. I wish the towels were all the same colour, but since my son likes different kinds of towels, I will just settle for them being clean and organized. Didn't the labels turn out well. I used my silhouette cameo to make them! I have not shown the bathtub and bath toys, because I am working on something for there. Once that is ready I will share.